FREE Joe Boxer Women's Red Ballet Slipper! You are here: Home / Great Deals / Christmas Deals / FREE Joe Boxer Women’s Red Ballet Slipper! FREE Joe Boxer Women’s Red Ballet Slipper! Sears has this Joe Boxer Women’s Red Ballet Slipper on sale for $4.99 (Reg. $15) and you can get back $5.04 in Shop Your Way points, making it FREE! Plus you can get FREE in-store pickup or FREE in-store pickup! Heighten your state of relaxation with these women’s Joe Boxer ballet slippers. 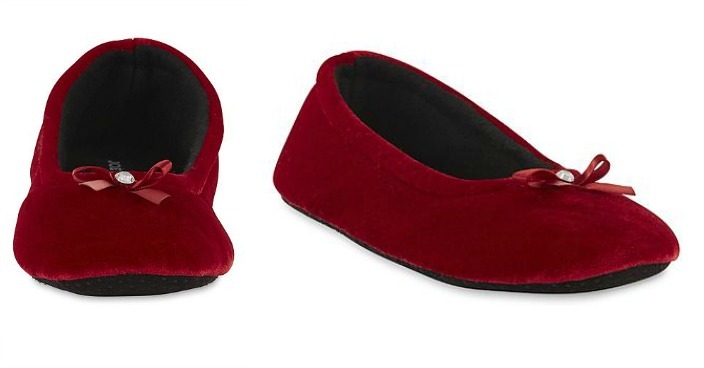 Softly structured with luxurious velour, these slippers deliver a soothing feel complete with cushioning. A jeweled bow at the toe adds a decorative touch to your lounging. Stippled soles offer slip resistance around the house. Final: FREE PLUS FREE in-store pickup or FREE in-store pickup!